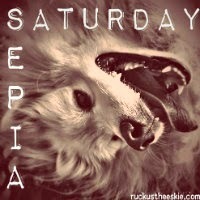 Ruckus the Eskie: Sepia Saturday #111: Happy Lunar New Year 2016! Super Bowl...and then Lunar New Year. The stars/moons have aligned! And Mardi Gras da day after dat! Mom Kim here - Team Beaglebratz had the chance to finally, again join in on the blog hop this time - it's been a looooong time. We'll be more interested in watching the action in the Puppy Bowl and a bit of the Kitten Bowl rather than the Super Bowl this Sunday.